During spring break this year, I spent some time worrying what a week off would do to the memory bank of my middle schoolers right before they take the state writing test. As teachers we know how it goes: you teach them something today, tomorrow they act as if they have never heard it before (insert face palm emoji)! So I certainly worried about all the information that they may forget coming back from break and straight into testing. Fortunately, we had one day before testing and I planned on honing in on one thing: Brain Dump. A brain dump is a strategy to un-clutter the mind by taking what is in the brain and transferring it to paper. All my middle schoolers will have a planning sheet during testing even if they are taking a paper based test or computer based test. So we spent the class period running through in our heads and conversing about what it would be like to take the test. Students shared feelings of nervousness, doubt, confidence, planned, etc. This allowed for the perfect segue into why I want them to do a brain dump on their planning sheet. 1. To prevent the reverting back to their old writing selves out of fear or doubt. In my writing classes, we speak in terms of preparation for college and career readiness. So I have some rules to help them on that path. "First, thou shalt not start an introduction with a question? Second, thou better have a thesis". Middle schoolers spent a lot of time in elementary learning to write for elementary and then I have one year to build on to that by adding or taking away things they have learned. 2. Even though I know my students spend a lot of time writing, not just essays, but short responses, responses to pictures, stories, etc. and were more than prepared, I did not want to chance them forgetting the basics. A house to represent how to structure an essay with evidence and elaboration as well as student voice/ style. I am currently writing a blog to detail this out so make sure you subscribe so that you will be notified of blog postings! 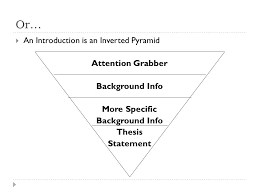 An inverted triangle to represent the introductory paragraph format. A standard triangle to demonstrate that ideas flow from specific to general in the conclusions which is the opposite of what happens in the introduction. So on their planning sheets, I told them to draw the three shapes as soon as they were allowed to write. The idea is that by looking on their shapes, they are reminded of the structure and basic essay format they were taught. For example, one of our classroom writing rules is "thou shalt not writing a body paragraph with only two pieces of evidence. When they draw their house with a window and door, they will hopefully remember the lessons in which we discussed that at a minimum, houses have two points of entry and evidence is a point of entry to develop their ideas further. Also, elaboration can be the four sides of a house securing and holding everything together. Without elaboration, the house can fall apart. Planning before writing is an important step in the writing process and more goes into that step than what was just discussed and these three shapes are a small part of what my students are expected to write on their planning sheet. But the reality is some students don't plan, some over plan, and there are those in the middle. This strategy is accessible for all my students. Remember that this was the summation of months worth of work with these extended metaphoric ideas. They were already familiar with the concepts but being able to sum up the bulk of what they learned in three images helped my striving to thriving learners.